The Trek Models P0621P and P0621N are DC-stable, high-voltage power amplifiers designed to provide precise control of output voltages in the range of 0 to +30 kV DC or peak AC (for the Model P0621P) or 0 to -30 kV DC or peak AC (for the Model P0621N), both with an output current range of 0 to ±20 mA DC or peak AC. 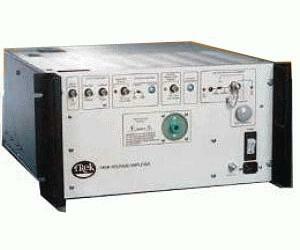 Both models are configured as noninverting amplifiers with fixed gains of 3000 V/V. Industrial and research applications include electrostatic scanning, pulsed field electrophoresis, and poling of materials. The Models P0621N and P0621P feature an all solid-state design, high slew rate, wide bandwidth, and low-noise operation. The four-quadrant, active output stage sinks or sources current into reactive or resistive loads throughout the output voltage range. This is essential for achieving the accurate output response and high slew rates demanded by reactive loads. The Models P0621N and P0621P are protected against over-voltage and over-current conditions that may be generated by active loads or by output short circuits to ground.